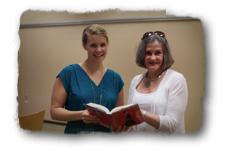 YA author Jackson Pearce (shown here with librarian Karen Swenson) spoke about navigating the publishing world and avoiding wrong, outdated, and confusing advice in her April workshop. From writing the ill thought-out query letter, to finding an agent, to negotiating advances and royalties, she shared her own publishing path to success, pitfalls and all. Helpful advice included why that important first point of contact with an editor or an agent -- the query letter -- sets the tone. How-to “Do Nots” aka “Don’ts” followed. These included such notables as “Don’t ask questions agents can say No to; Don’t share how long it took to write your book; Don’t lie/exaggerate (eg Opra loved it); and Don’t even bother offering a marketing plan. There were more useful tidbits, but you get the idea. Her Do’s were short and insightful. Do know the market. Do know trends. Do tell your own story with your own voice. Do be you. Jackson Pearce is welcomed back as the Author in Resident of the Northeast Spruill Oaks Library. Her topic this time: How to Conceive, Outline and Write a Young Adult Novel. It is scheduled for May 12, 10:30 a.m. at the NESO library. 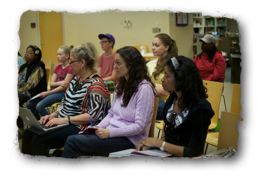 This craft-focused class discusses subject/age “appropriateness,” voice, character/plot arcs and why parents vanish in teen books. It’s geared to anyone interested in the YA genre, from true beginner to those working on revisions. It is a free workshop sponsored by The Friends of the NESO Library, Southern Breeze and the Society of Children’s Book Writers and Illustrators. Registration is required. More details available on my web site: Moodyviews.com under Workshops.